It sounds something of an oxymoron to say we are in the wettest drought, but that is what we are in. Ever since an official drought was declared all it has done is rain, rivers are swollen, towns are flooded. For the last three weeks it has rained. For the last week monsoon weather. There have been days during the last week when it has started to rain late at night, early hours of the morning, it is then continuous heavy rain most of the day. It was like it one day last week, it was like it Sunday. On the days when it rains it is cold, the temperature drops to 7 C. Then we get sunny days, sunny days with cloud. That is how it was Tuesday of last week. I took the train down to Liphook, where I had pub lunch with Canon Andrew White, his wife and three of his colleagues. The train passed through wooded countryside, a green haze as I looked into the woods, the trees were coming into leaf, little patches of primrose, a fox basking in the sun. On my way back, I could have stopped off in Guildford, but I was tired. When I got home, I enjoyed the sun in my garden. And yet the day before was cold and wet, only 7 C.
Friday was a lovely sunny day, I went to Guildford for the day. The River Wey was high, muddy and flowing very fast. Riverside properties were flooded at ground level. Saturday was cold and wet, only 7 C.
Sunday very heavy rain from late Saturday night until it finally eased off mid-afternoon. It was not though cold. The wettest drought. April 2012 the wettest April since records began in 1910, and April is not yet over. Today, Monday, a lovely warm sunny day, 18 C.
I have made the most of it. I have been working in the garden. The lawns mowed, the grass has not been cut for a week. The compost heap rebuilt. The blackbirds and robins had all but demolished it in their search for compost worms. An area cleared of weeds, the ground forked. This has been cleared for sweetcorn. Some of the weeds have been piled on top of the compost heap. Maybe this will deter the blackbirds and robins. I really need to build a new compost heap, but until I clear the old one, nowhere to build it. My peas are a coupé of inches high, broad beans about an inch high. The bluebells in the woodland area at the bottom of the garden are beginning to come into flower. The patch by the house have been in flower for a couple of weeks. 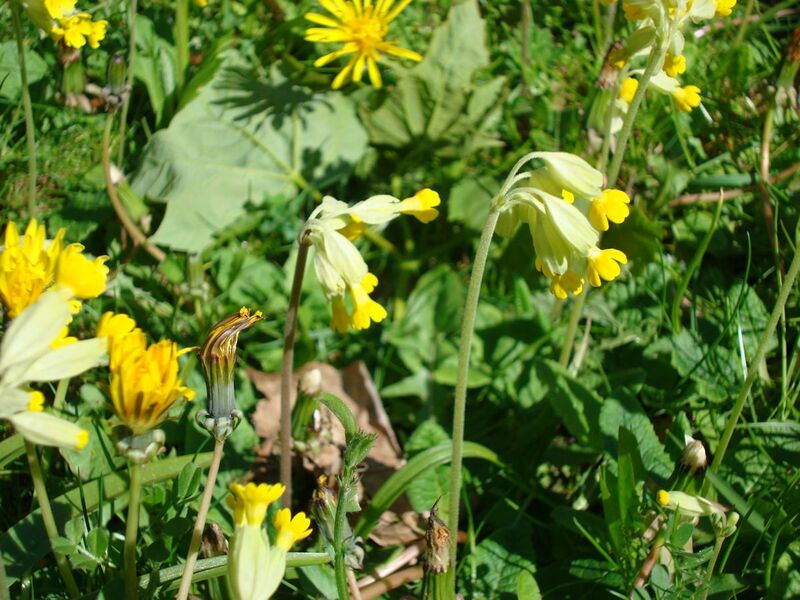 The grass clearing in the woodland area is carpeted with cowslips in flower. Imogen Heap drew her inspiration from Where the Mind Is Without Fear when writing Minds Without Fear, heapsong4, the fourth track on the album Heapsongs. Rabindranath Tagore (1861-1941), Indian poet, philosopher, and Nobel laureate, was born in Calcutta, into a wealthy family. He began to write poetry as a child; his first book appeared when he was 17 years old. After a brief stay in England (1878) to study law, he returned to India, where he rapidly became the most important and popular author of the colonial era, writing poetry, short stories, novels, and plays. He composed several hundred popular songs and in 1929 also began painting. Thursday, to much fanfare, M&S launched shwopping. M&S were concerned at the billion items of clothing that go to landfill every year. They wished to do something about it, bring your unwanted clothes to M&S and M&S will recycle the clothes. A dumb video featuring Joanna Lumley emptying her wardrobe and taking her unwanted clothes to M&S to be recycled. The CEO of M&S was asked could people bring their unwanted clothes to M&S and not buy anything. The fraction of a second hesitation, before he answered yes, said it all. The day after the launch. I checked out shwopping. A big poster in the window of M&S, very much in your face as you walked into and around the store, even the staff wore badges encouraging you to shwop. You could not miss that shwopping was the next big thing, the future of fashion, as M&S claim. The store was not, as I expected to find, awash with unwanted clothes. I asked a very helpful lady, had they been inundated with unwanted clothes all day. No, she replied, she did not think any clothes had come in. She pointed to a small box where people were to dump their unwanted clothes. Could we please have a look inside, I asked. We looked and found a couple of carrier bags of what we assumed to be clothes. Is, this it, I asked. Looks like it, she replied. She then explained how the scam, oops sorry, scheme worked. People were to go through their wardrobe, find all what they did not wear and bring it into M&S so it could be worn by someone else. So far, so good, but not quite the stopping unwanted clothes going to landfill as the clothes were not going anywhere, the clothes were sitting in a wardrobe. She then went on to explain that whilst in M&S you could buy new clothes, and that there was an incentive to do so as you could enter a prize draw and win £100 of M&S vouchers. Come in store for those new season’s ‘must have’ and bring an old item of clothing with you. And there you have it, this is not a green initiative, this is about shopping, buying those ‘must have’ fashion items, consumerism writ large. The very name says it all shwopping not shwapping. The emphasis is on shopping not swapping. One is tempted to suggest M&S would achieve its aims better if it discouraged feckless clothes-buying, by specialising in more expensive investment items, made in Britain, like it used to. Or refrained from selling so much of its food in plastic packaging. But all retailers want consumers to keep consuming. If they can market the idea that it’s green to do so, they will. And “Shwopping”? It’s an ugly word for a mildly dubious enterprise. I don’t suppose there’s much harm in it. But I can’t help feeling it’s not good enough for such enthusiastic endorsement from Lumley. Some apologists say it closes the loop. No it does not, as you are going out and buying new clothes. Shwapping, closing the loop, would be to buy from charity shops, donate to charity shops. M&S are to be complimented on a very slick marketing campaign, ease the conscience, whilst carry on shopping. This is a bit like airlines who offer to plant a few trees to offset the carbon of the flight. Only it does not. The carbon of the flight is emitted over a period of a few hours. The tree absorbs the carbon over seventy years for a fast growing tree, a few centuries for a slow growing oak. And this ignores who looks after the trees, who safeguards the trees. Fast fashion is a very dirty industry. Growing of and processing cotton (unless organic) is highly polluting. Irrigating cotton leaves the land coated in salt, the hazardous chemical sprays pollute the land and water supplies, processing of cotton, the bleaching and dying, more hazardous chemicals. Then the cotton goes into the sweatshops to be turned into the clothes we wear. Anything that closes the loop, that uses natural materials, is to be welcome. But that is not what M&S is doing. Slow fashion: Clothes that are well designed, clothes that look stylish, clothes that we value, that we launder and repair, clothes that can easily be recycled. Fast fashion: Cheap clothes (though at a cost to people and planet), clothes we throw away, that cannot be easily recycled and end up in landfill. Slow fashion will come from a small designer, we can ask where the clothes come from, how they were made, the materials used. The CEO of M&S claimed they were buying British. Thursday evening In Business on BBC Radio 4 looked at what was left of the textile industry in Lancashire. One of the mills had M&S pull the plug and they collapsed overnight. The CEO of M&S claimed they were the No 1 High Street retailer on the environment, way ahead of other High Street retailers. Really, thought I, is that why you import King Edward potatoes from Israel? What of Lush, thought I. Next visit was to Lush. I told them of shwopping and the claim from M&S No 1 on the environment. To say they were incredulous would be an understatement. Why do you not shout about your environmental credentials I asked. We do not need to all the staff chorused, all you have to do is look around our shop and you can see with your own eyes. We then had a long discussion on environmental matters and I signed their petition calling for a ban on animal testing of products. How many products in M&S are tested on animals? It is not what M&S say they are doing, but what they are doing that matters. I picked up from M&S a prawn and avocado sandwich. It was inside a paper bag with a plastic window. The paper bag was lined with plastic. Virtually impossible to recycle. When I opened up my bag, I Found my sandwich to be inside a plastic tray! The only positive thing about the M&S cynical greenwash exercise, is that it has highlighted the amount of clothes that go to landfill. But you do not solve this by emptying your wardrobe and restocking it from M&S. You solve it by adopting slow fashion. Slow fashion is the fashion of the future simply because it is the only fashion that is sustainable. Will M&S be advising to buy quality clothes, to not buy so many clothes, to look after our clothes, to recycle our unwanted clothes to extend their useful life? – Do we recycle enough of our clothes? Beautiful spoken word set within a background of music. Neglected Space (Heapsong3), the third track on the album Heapsongs by Imogen Heap. The tracks of Heapsongs are crowd sourced, each is a community, collaborative venture. Each track has its own micro-site on the net. Each track has a story to tell. England used to be a country of walled gardens. A vegetable plot, a herb garden, an orchard, a greenhouse. All traditional, heritage varieties. Not far from the Roundhouse, a Georgian garden, sadly neglected. Imogen used this local garden for inspiration, raised awareness, funding. 2 minutes walk from my house there is a Georgian walled garden in need of a lot of help. In it’s heyday it was a kitchen garden at the peak of gardening technology. The size of a football pitch, with walls 4 metres high, inside growing amongst other things were pineapples in greenhouses. It’s had quite a history but sadly over the last 30 years it’s fallen into disrepair and mostly been neglected. 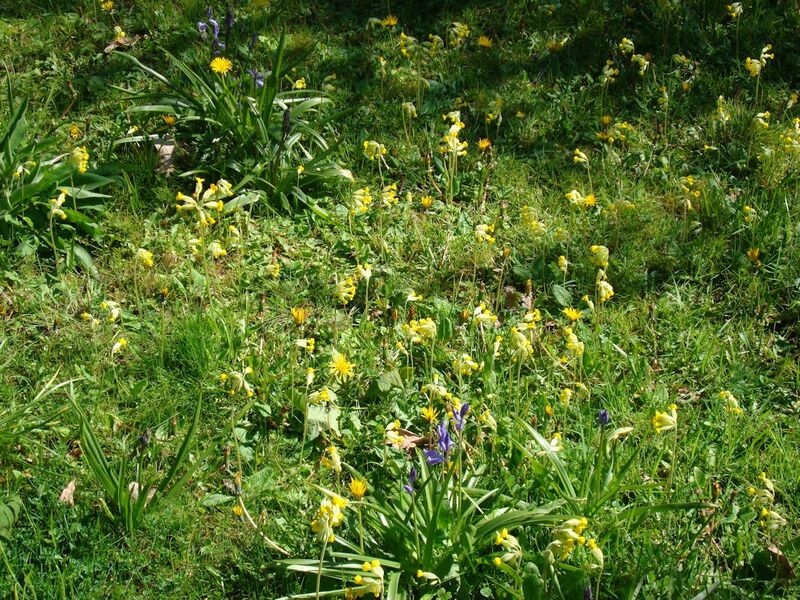 With the help of Clear Village and our ‘Garden Angels’ (volunteers) we plan to help to bring the garden back to life with the local community, putting spade to soil, as I wander about the garden putting pen to paper. The piece I want to write is from the voice of the Walled Garden itself. A spoken word piece or perhaps a kind of collective voice for neglected spaces and abandoned man made structures. Being in the garden, I hear it almost sigh in relief with the news of this fresh enthusiasm. As if it’s been calling out to anyone who might catch it from dust, to fall in love with it again. As those of you involved breathe a new life into the garden, community and beyond, it becomes clearer to me what it’s been missing all these years and between spurts of getting my hands dirty, I’ll be penning these thoughts. There’ll be the odd camera about, filming the making of Heapsong3 and the garden’s progress. I may occasionally bring in an instrument into the garden and see who steps up to the challenge of making a noise, or perhaps come up and record the sound of whatever it is you’re working on. The volunteers working in the garden and Imogen wrote blogs as the work progressed. Vitamin String Quartet perform a wonderful improvisation of Lifeline, heapsong1 on the album Heapsongs by Imogen Heap. Writers write to be read, musicians play to be heard, and hope to make sufficient money not to be starving in a garret, but I do wonder with some musicians, some writers too. To find Vitamin String Quartet Performs Imogen Heap on the Vitamin String Quartet website I had to trawl through pages and pages of albums. I think I was on my eighth or ninth page. Then when you get there, all you find is a few seconds lofi sample. To hear their excellent improvisation of Lifeline, you have to rely on some kind soul doing their work for them and uploading to youtube. On spotify they get doubly ripped off. It is the facebook model, used to collect personal data, a cut goes to the major record labels. iTtunes rips off too. Vitamin String Quartet are on their own independent record label, Vitamin Records, why therefore are they letting the major labels take a cut? On the other hand on bandcamp, what people pay goes straight to them, you can listen to the entire album, sharing is made easy. Were it not for a kind mention by Imogen Heap, I would not even know of their existence. What the rest of their album is like, good or bad, I do not know as all they make available is few second samples of lofi. I am somewhat baffled and rather concerned that a comment made on a web page on the site of Imogen Heap appears not on that page as one would expect but on facebook! Does this imply that accessing a facebook app, but not accepting, steals personal data as though one has been foolish enough to accept? You are currently browsing the Keithpp's Blog blog archives for April, 2012.